A successful camping or road trip is incomplete without a comfortable, well-functioning RV. If you have to spend countless hours working on your vehicle, dealing with breakdowns, or charging a battery, you won’t have time to enjoy the great outdoors or the company of your friends and family. Therefore, the battery of your recreational vehicle is a vital member of your camping necessities. You should take great care in selecting the best RV battery and be sure to consider all of the factors that may impact its longevity, productivity, and compatibility with your vehicle. Why Do I Need an RV Battery? In short, every owner needs an RV battery for their recreational vehicle. Nearly everything in the vehicle relies on an electrical system to function. Deep cycle batteries are equipped to store huge amounts of energy for extended periods of time. 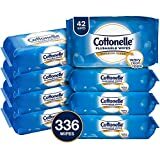 A good one can last for up to five years – in some cases even longer! When fully charged, an RV battery will give off more voltage than a typical battery. 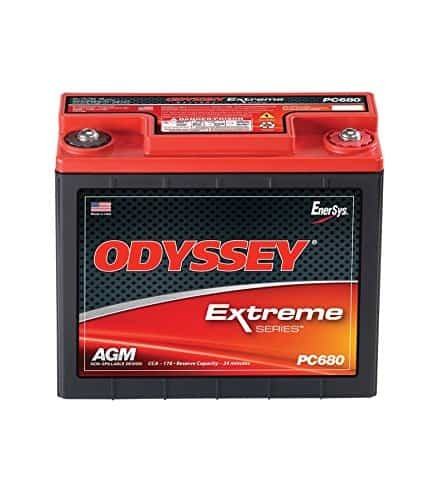 While you are likely already familiar with the starting battery, used to start the vehicle’s engine, a deep cycle battery is the one needed to give a steady amount of power to other functions of the RV. Marine batteries, on the other hand, combine the two and are a good option for busy motorists. What Should I Look for in Choosing The Best RV Battery? There are many types of RV batteries, but most will give you the ability to use all of your devices and appliances without requiring grid electricity. 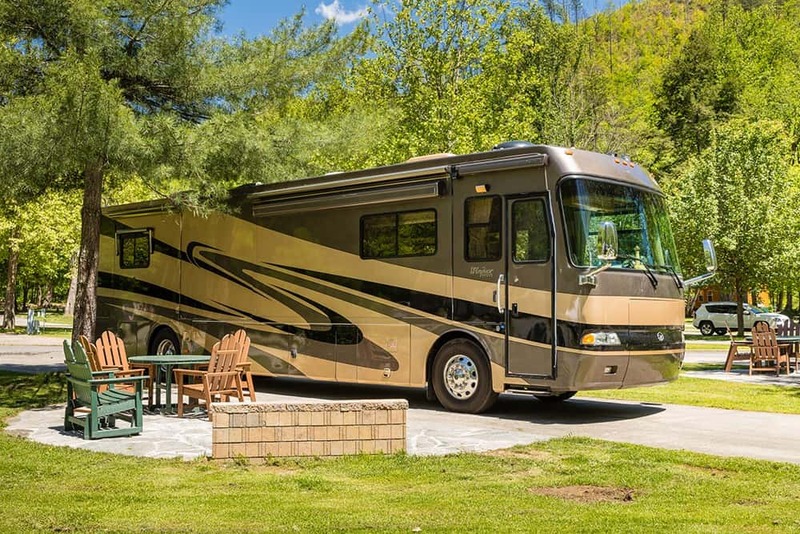 Your recreational vehicle will likely require a house battery as well as a starting battery for the engine. House batteries may consist of a few single batteries wired together to supply power, but the one that you need to start your engine is similar to the one used by your personal car. The starting battery in an RV is larger, however. When considering your next RV battery, think about the following factors. 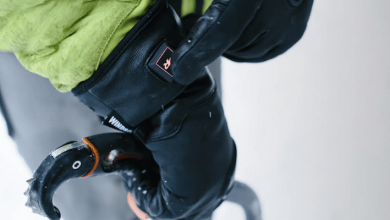 CCA (which stands for cold cranking amps) is the industry standard system for measuring how much current the battery can provide at cold temperatures (exactly zero degrees Fahrenheit). The higher the CCA value a battery has, the more likely it is to be successful at all temperatures, but particularly in very cold ones. No matter where you plan to travel, you should look for an RV battery with a high CCA value. You should also consider how much power a battery can store, and for what period of time. 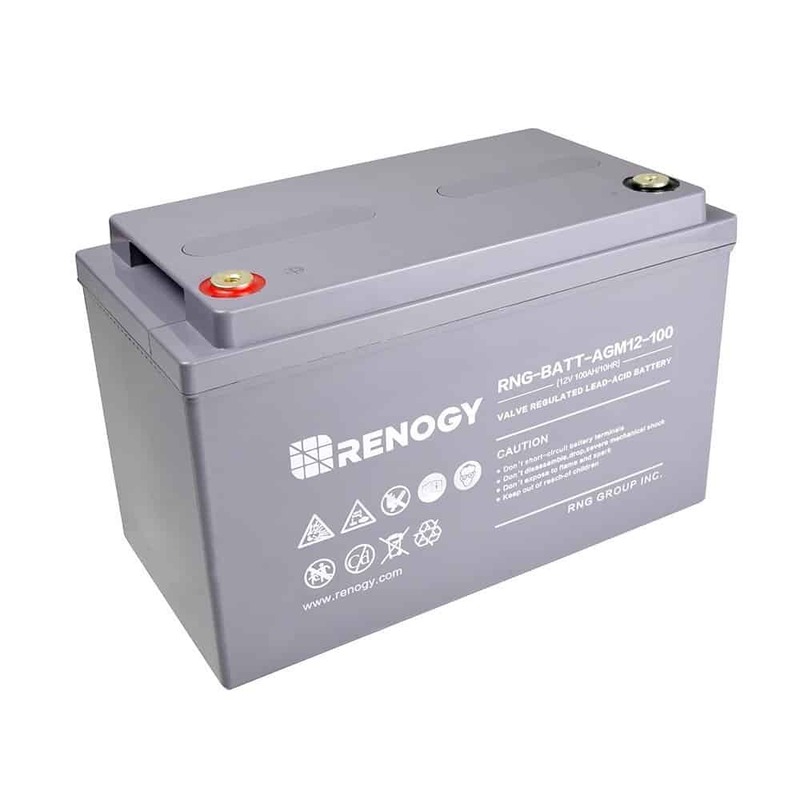 A deep cycling battery will store larger amounts of power for a longer period of time, possessing a larger surface area and the ability to provide current to every single electrical component you might have in your RV. While the optimal RV battery will vary depending on your personal goals, travel habits, vehicular needs, and other preferences, the best will be one that can output high amps, or power, taking only a few seconds to do so. This will help keep your RV’s engine functioning optimally and keep you on the road and enjoying your travels for years to come. This minute, compact battery packs a wallop at 44 AH. While it’s not the most powerful model on the market, it is suitable for an average-sized RV or for more modest camping pursuits. The battery can withstand vibrations well and is suitable for heavy-duty applications. With a long lifespan, it’s a good option to consider. This battery also has a nicely sealed design, preventing it from leaking battery acid and allowing for installation in any position. It has a reserve capacity of ninety minutes so that there is no interruption in the flow of current for whatever reason. 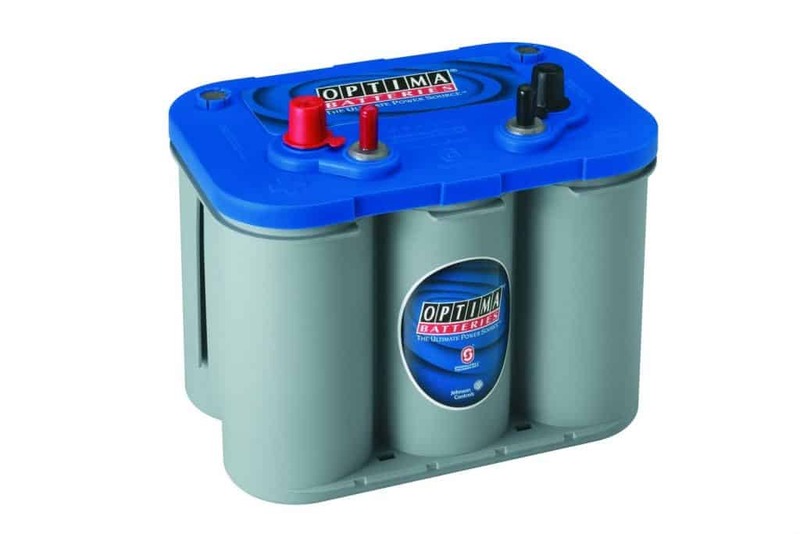 Another Optima product to consider is the BlueTop Marine Battery. This popular deep cycle marine battery is also small in stature, but has a slightly higher capacity of 55 AH. Though not the highest capacity of all batteries on the market, it is more than effective when used in an RV. It has a high CCA value of 750, making it an ideal choice for low temperatures, and comes in a sealed design to prevent leakage and to allow for flexible installation. 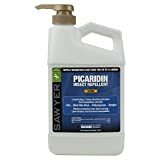 This is the best model to consider if you are looking for a compact heavy-duty model with high cold resistance. This battery is versatile and rugged, built solidly out of reliable materials to help you get through any powering situation for any kind of RV. Regardless of the environment in which you install it, this battery holds up to expectations. It is good on rough terrains and has a non-spill design. It is vibration-resistant and has twice the power and three times the lifespan of average batteries sold today. This battery can provide up to 400 cycles at eighty percent discharge depth, giving it the ability to withstand any conditions. It can survive harsh temperatures and is offered at a reasonable price, making it a good choice for any motorist. 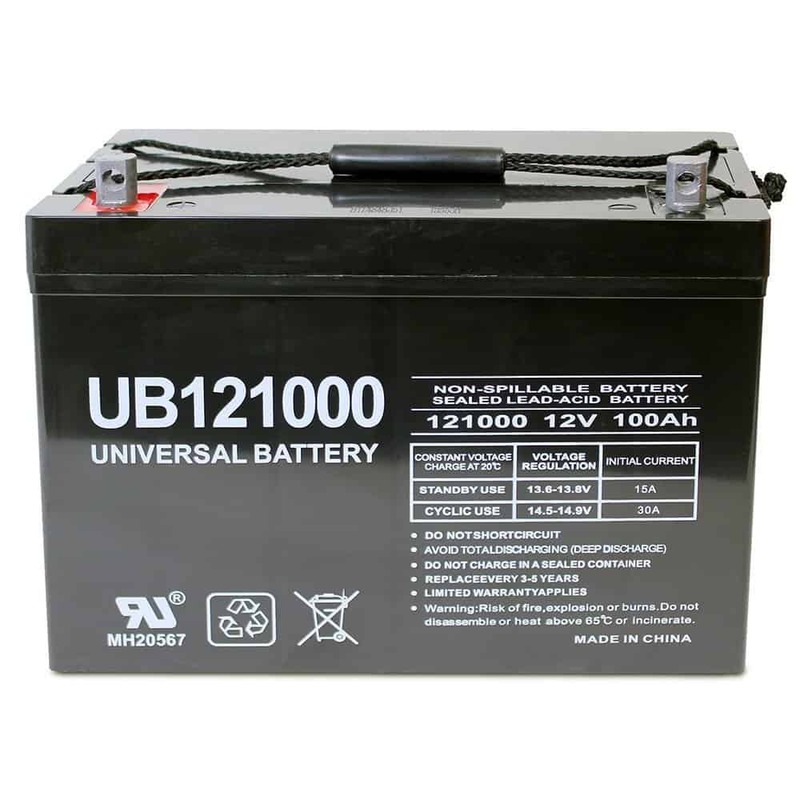 This battery, manufactured by Universal, is purportedly one of the best deep cycle batteries on the market. It can handle a variety of uses, and works well for general use as well as for supplying power to consumer electronics. 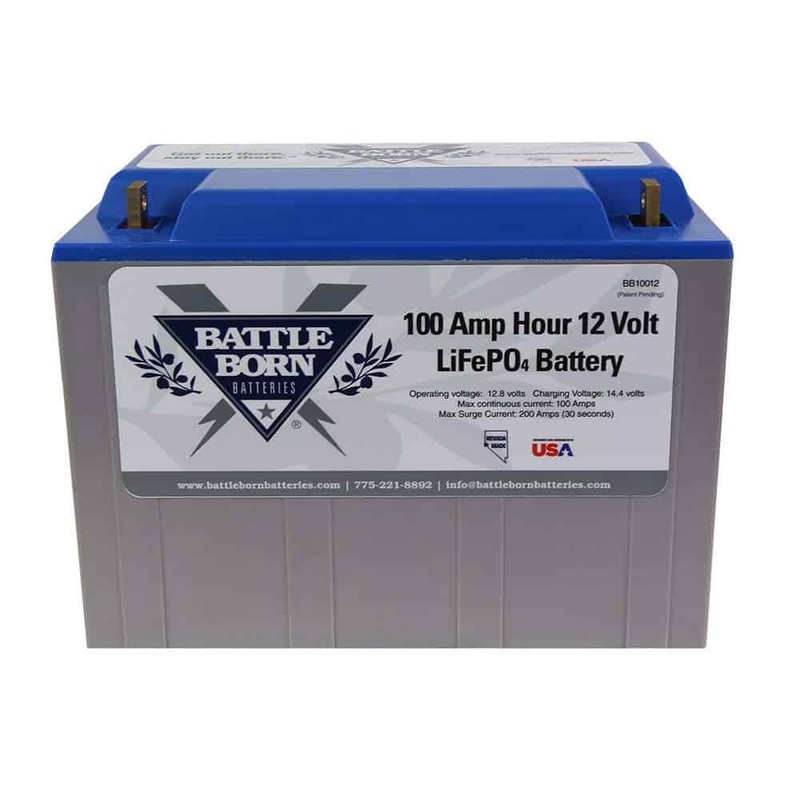 It has a sealed design making it efficient and environmentally friendly, and it utilizes the popular AGM technology that is used in many top-rated batteries. The battery requires the least amount of maintenance compared to other batteries, and has a 100-ampere-hour rating. It has an impressive storage capacity and high longevity, offering better performance and quicker recharging that similar products. It can be used for trolling motors, boats, solar panels, and other equipment besides RVs as well. This battery has a long lifespan and is heavy-duty, constructed with military grade plates that are guaranteed to last longer than its competitors. 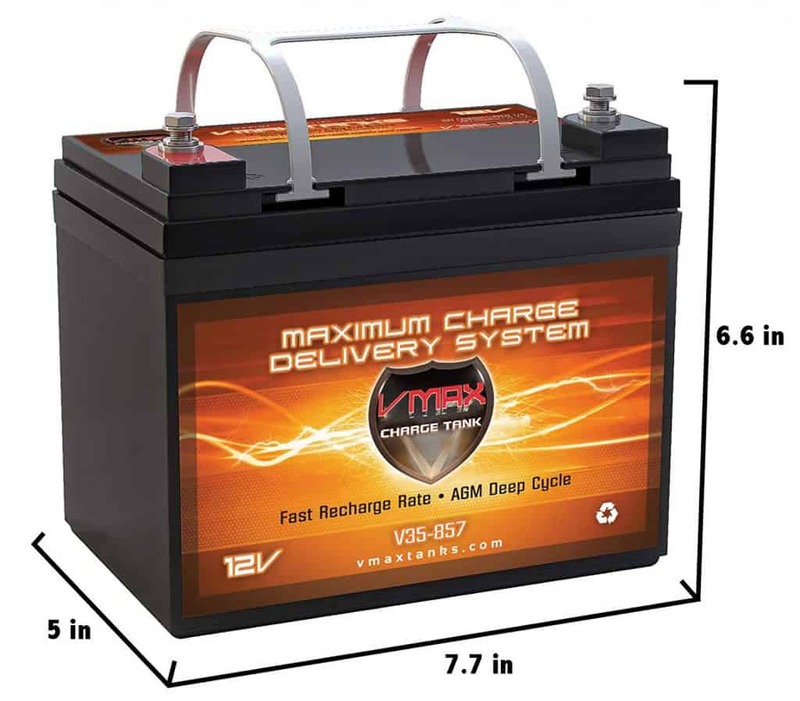 It has a high capacity of 125 AH and can last for up to ten years. 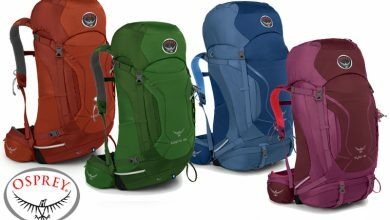 It has a handle at the top to make it easier to carry, and withstands vibrations even in rough terrain. The connection studs are comprised of stainless steel materials, making it corrosion-free to prevent wear and tear down the road. 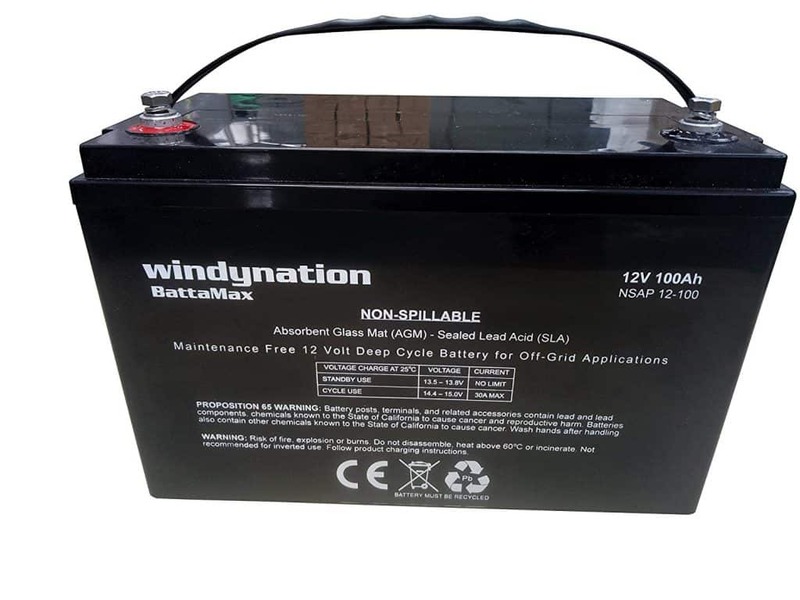 This battery is designed to provide a high capacity for demanding electrical needs in any RV It is cost-effective as a lead acid battery and has a capacity of 100 AH. It can supply a powerful current to an RV and can be purchased in different capacities or numbers depending on your specific needs, RV type, and camping goals. This RV battery is versatile, providing everything from solar to boat to RV energy. It has a floating life of up to twelve years, making it one of the longest-lasting models on the market. With a 240-minute reserve capacity, you don’t have to worry about this battery failing on you. It has a low discharge rate because of its high lead content, and is highly flexible for any application. Considered by many users as the “ultimate” RV battery, this product has a high rate of user-friendliness and is a top choice for many motorists. It has a capacity around 100 AH but has a 200A output. It can power the hungriest devices in an RV and has up to 5000 recharge cycles, contributing to a long lifespan. This product comes with universal connector studs to make it easy to install in any RV. 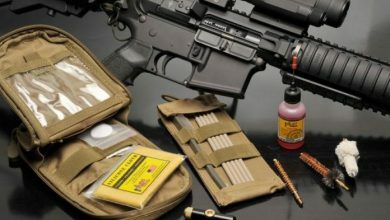 It is built in the USA and comprised of durable materials that are some of the best on the market. This adaptable battery comes in three different sizes, equipped with 6 V 260 AH, 12 V 200 AH, or 12 V 100 AH capacities, with each providing varying amounts of voltage and taking up different amounts of battery installation spaces. All three sizes, however, are deep cycle batteries with low discharge rates. They can provide consistent, high power to demanding devices and can keep a charge for up to nine months. This battery is nearly indestructible, made out of fiberglass sheets that can withstand varying temperatures and high vibrations. It comes with a carrying handle and is incredibly sturdy. An RV battery is essential for any motorist or camping enthusiast. 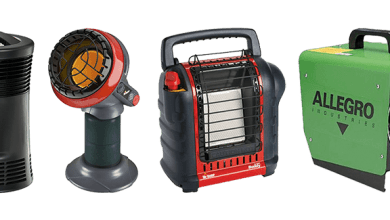 You need a tool that will provide enough current to power all of your electrical devices and, in some cases, your recreational vehicle itself. While this battery uses a different technology compared to your regular car battery, it is just as important a feature. RV batteries tend to be much more expensive than traditional lead-acid car batteries, but investing in the best RV battery is imperative. Try to find a battery made out of durable materials that will not leak every time you move it. Go for quality over cost, and always remember the features that are most important to you when you are shopping for your next battery. Our pick? 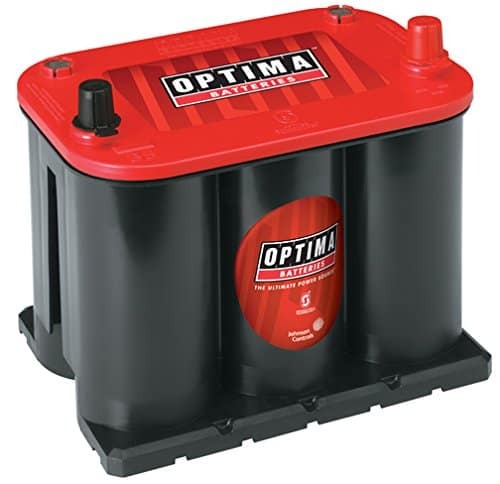 While all of these batteries are perfectly suitable depending on your needs, budget, and lifestyle, we would go with the Optima RedTop Battery. This product has some of the best reviews across thousands of users, and is a moderately-priced battery that can fit into any motorists’ budget. It provides for maximum output at minimum expense and is a fan favorite across all categories. If you’re still stuck between all of these fantastic options, consider consulting your local RV dealer for a suggestion. They will likely be able to help you weigh the pros and cons between the models, and you will soon find yourself with the RV battery you need – so that you can embark on the camping or road trip of your dreams. Zach is a professional saltwater fisherman and avid outdoorsman. His enthusiasm for outdoor products led to the creation of "Fishing Supply World" in early 2016. 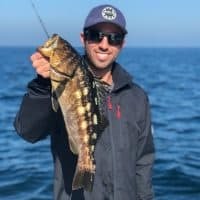 Zach is a full-time yacht broker in San Diego, California and specializes in sportfishing vessels. His worldwide travels have offered unique experiences that are shared on this website. He is currently working to attain a USCG 100-ton captains license.